Twitter began to buzz this weekend when reports circulated that comic books were banned from checked luggage leaving San Diego, Cali., the site of Comic-Con. While it’s true those claims were made, the Transportation Security Administration vehemently denies that they’re correct. Tweets like this got travelers leaving Comic-Con, and social media, very nervous. “I do understand, although we are working to independently take care of this, that some airlines, including United Airlines, put out false information that TSA was not allowing this....We would encourage people to travel however they would like. It will be screened. We’re in the process of trying to correct incorrect information the airlines seem to put out,” Dankers added. Pack items such as stacks of brochures and assorted comic books in your carry-on bag, Place them in a bin prior to sending them through the x-ray. Packing these items in checked bags often causes alarms leading to bag searches which can cause a significant slowdown in the screening process leading to delays and bags possibly missing their flights. We’ve reached out to United for comment and they said the following. 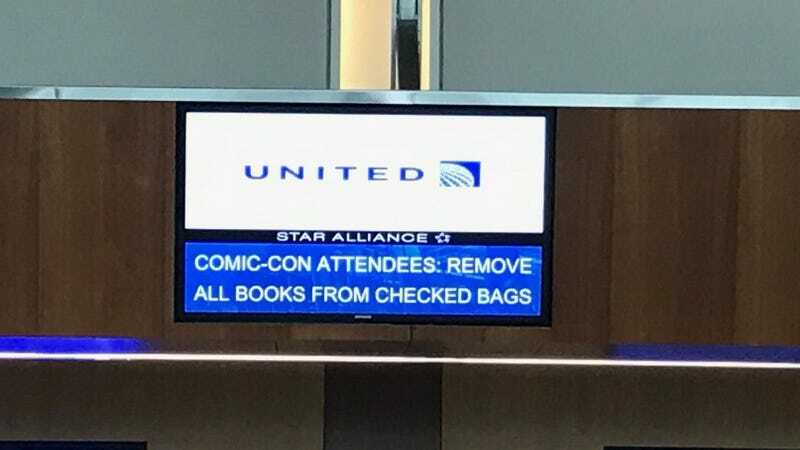 While TSA is recommending that customers keep their comic books in their carry-on bags, there are no restrictions on packing them in checked luggage. We misunderstood TSA’s instructions and regret any inconvenience this may have caused our customers. This is after TSA began responding to them on Twitter. Seems like we can pack this story up and send it on its way. Update: We added the statement from United, which was not in the original post.